As the Pop up Market approaches I feel the need to revisit recipes and test them more often until they are absolutely nailed. One of them is the carrot cake recipe from last year. I guess I love carrot cake more than any other. I know its not the most glamorous cake and for Christ’s sakes, what about chocolate and berries but I love that its so beautifully spiced and hearty and vegetable infused. Another thing that I love about it is that its not overly sweet or heavy. 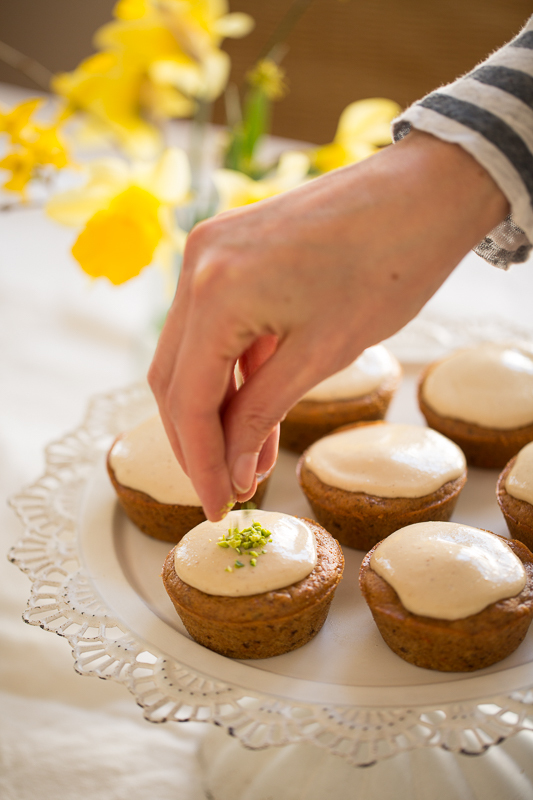 I also somehow associate carrot cake with spring because the first carrot appear at the farmer’s market. What I do love is the simplicity of it as well. All together I really enjoy the process of baking. Sometimes when I’m alone at home and the kids are out I like the silence of baking by myself. I have plenty of time and I start by imagining what I’d like to bake and explore some ideas on the internet. Pinterest is also quite inspirational when I’m not sure what I’d like to bake. Next, I’ll see what is in my pantry and what I can bake. 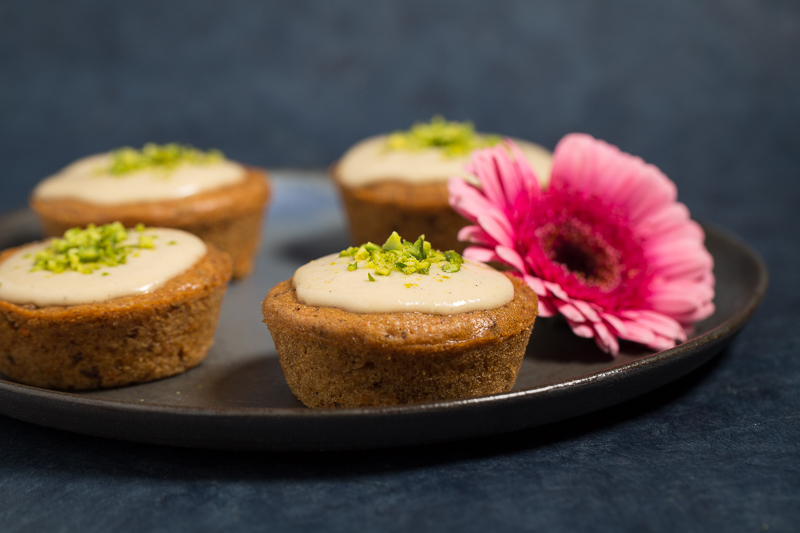 For that reason as well , carrot cake is great because most people will have carrots at home and the other ingredients I usually have on hand as well. Since I’ve been experimenting with making vegan cheese I would also like to share my cashew cream cheese frosting soon but this time I kept it simple. 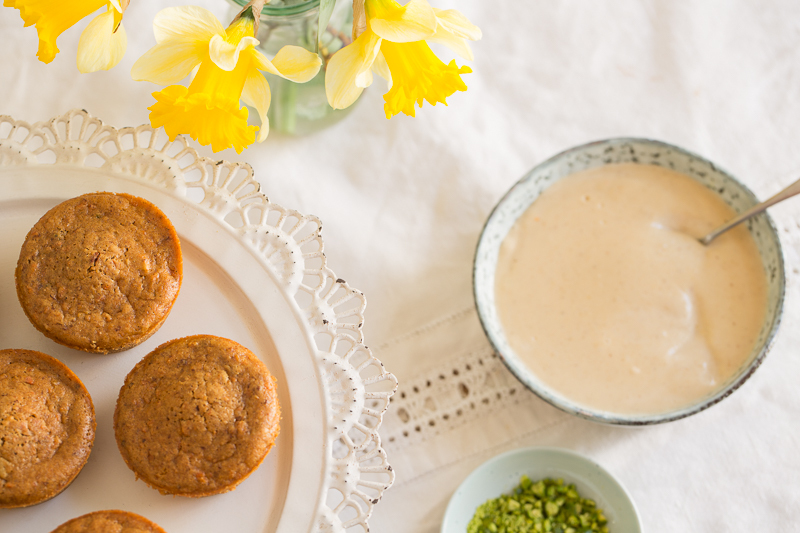 A simple blended cashew cream frosting and a little green from pistachios to remind me that its Spring. The beauty of Spring is also apparent in the nature and the wild garlic is spreading like wild fire in the local woods. 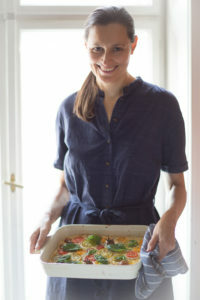 I am yet to make a recipe on the blog with wild garlic but it is in the making and I’m looking forward to it. Spring pulls me out of the house usually. I can’t help it. I want to soak up some rays of sun and blossoms everywhere. So to move on to the recipe. I think you’ll love this recipe. It is a real winner with most eaters, omnis included. 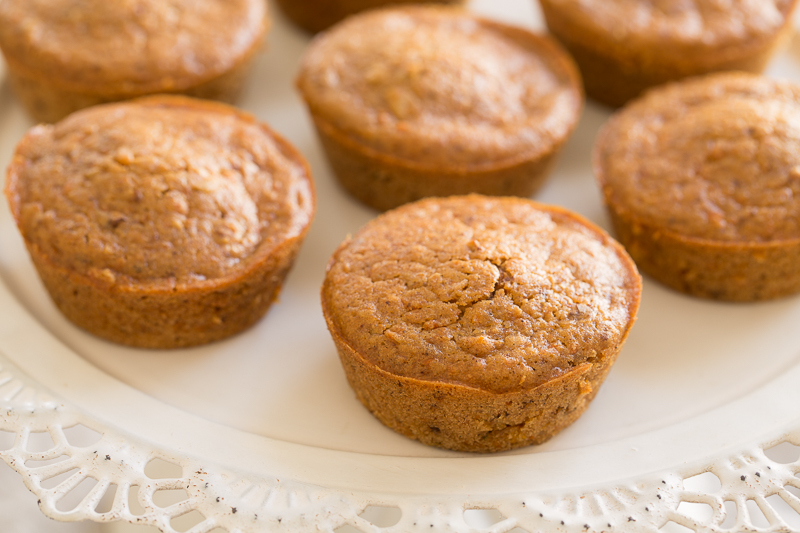 To whip these up it takes about an hour in total and they are very moist and lightly sweetened. The past weekend we spent doing a lot of shooting and recipe testing and I am excited to share new recipes with you. Stay tuned for some wild garlic treat! Have a lovely day! Preheat the oven to 180 °C. 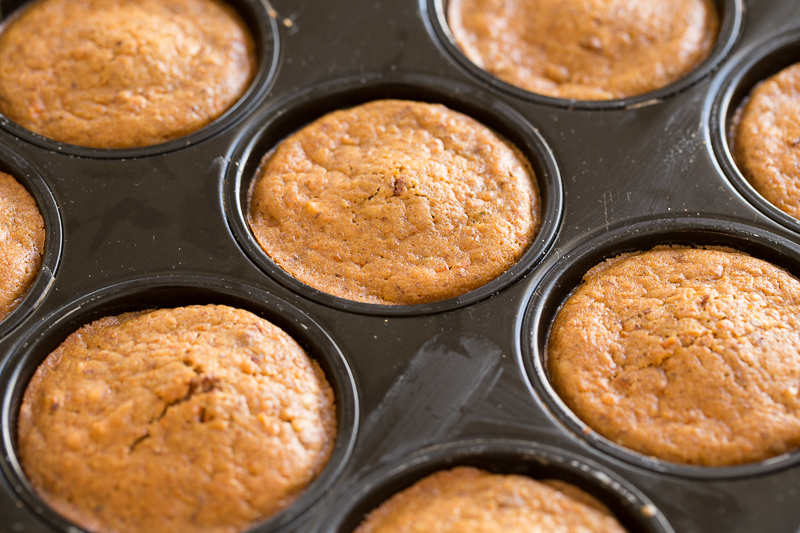 Line a muffin pan with liners or grease each hole with a little coconut oil. In a large bowl whisk together all the dry ingredients except for the walnuts. 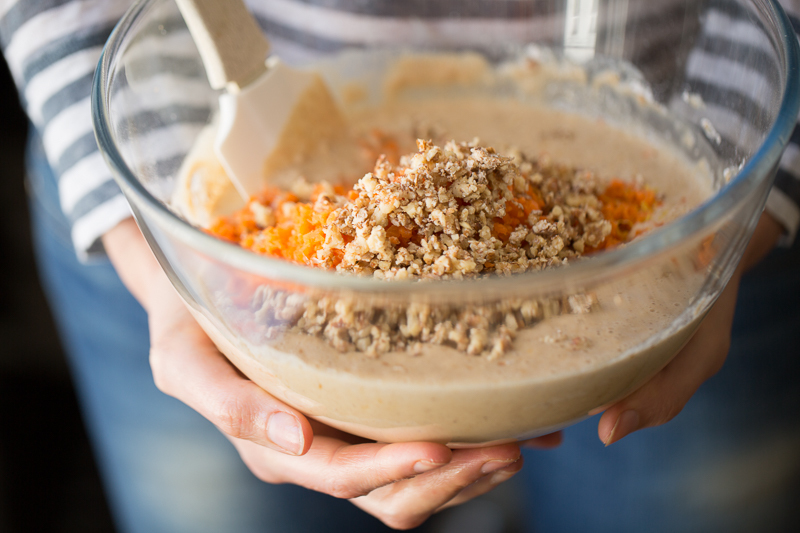 In another bowl whisk together all the wet ingredients except for the carrots. Whisk the two together folding in the carrots and walnuts last. Bake them for 20 minutes and check for doneness but inserting a toothpick in the center. If it comes out clean they are done. 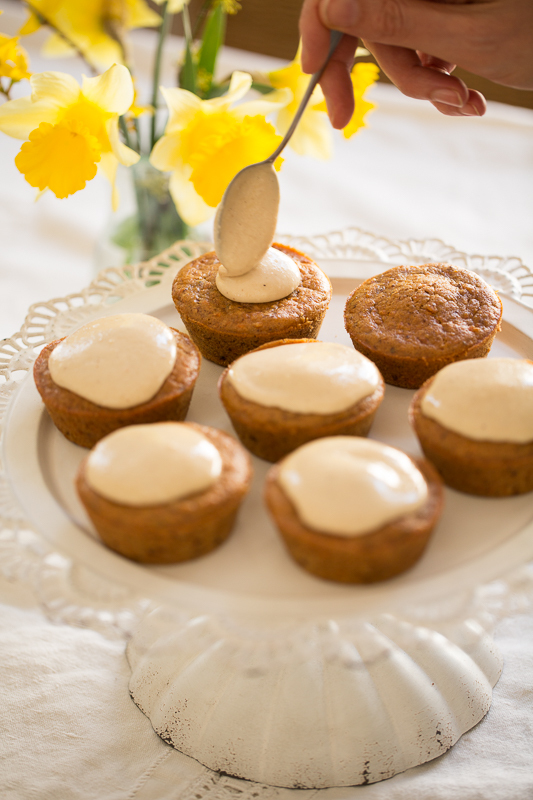 Set aside to cool and make the cashew frosting. 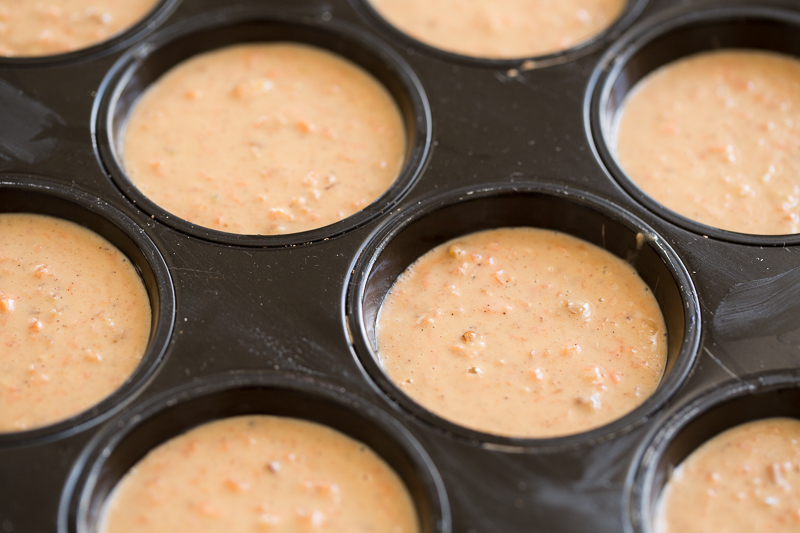 Blend all the frosting ingredients until creamy and smooth, about 2 minutes. Scrape down the sides of the blender if necessary. Place the frosting in the fridge for about 30 minutes before glazing. 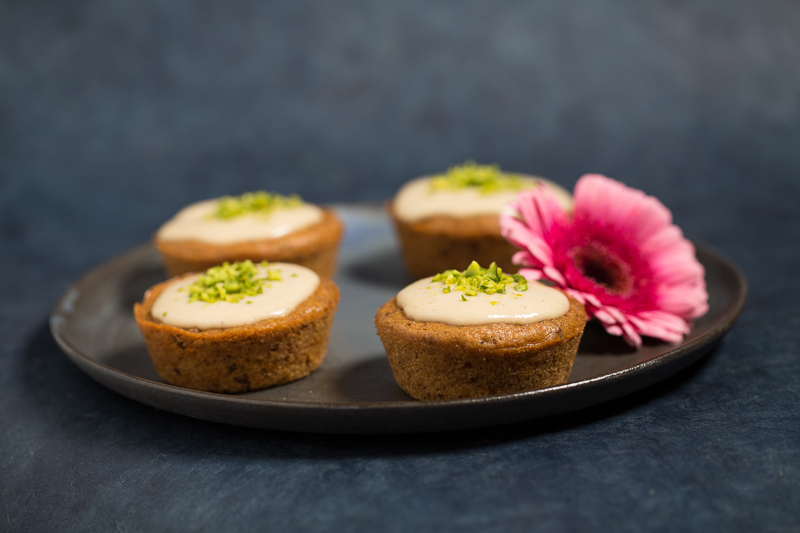 Garnish the cupcakes with cashew frosting and pistachios and enjoy with tee or coffee.